We had a party this weekend. It was more like a two day meal. It was a 20-year reunion of friends from my Junior Year abroad, in Italy. Together, we are an eclectic group of artists, architects, teachers, chefs, florists, gardeners, scientists and – of course – writers. Since we graduated from the program, all of us have gone our separate ways, but stayed in touch. 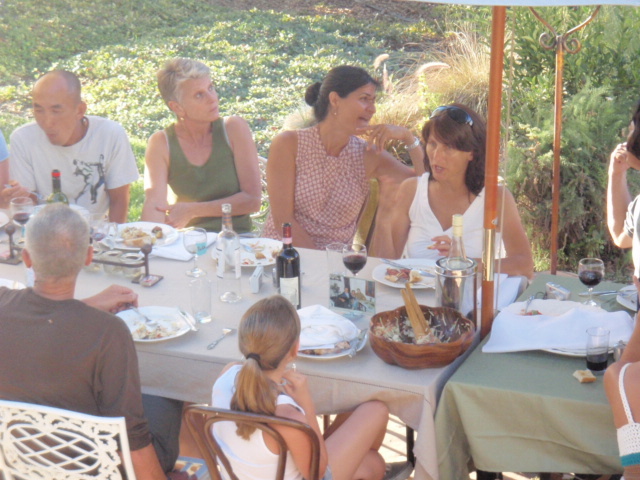 Coming togther on the ranch was a celebration of food, wine and good laughs. My friend and roommate in Florence, also named Julie, still lives in Italy and brought her two sons who speak only Italian. Joe barbecued hangar steaks of Morris Grassfed Beef, seasoned in a dry rub for 24 hours before they touched the grill. So delicious, with a glass of Chianti. We had heirloom tomatoes from my friend Kristen’s L.A. garden (she’s a pastry chef at the W Hotel), wrapped prociutto and melon, made by Tai, (gardener for the City of San Francisco), and a colorful summer salad from Joanne (a Berkeley architect). The hills in San Juan Bautista are not unlike Tuscany: rolling and studded with trees. As the evening turned to night, our candles shed a mellow glow on the party. My friend Reka pulled out the Limoncella from our freezer and we started getting silly. I don’t remember what time we finally called it a night, but we awoke to warm croissants and Peet’s coffee (thanks Joe!) Bella Italia.